At a guest house in the beautiful Franschhoek wine valley, a famous English mathematician is kidnapped and his two bodyguards killed. It's clearly a professional job, and the spent shell casings offer a chilling clue: each is engraved with the head of a spitting cobra.Meanwhile, in Cape Town, a skilled young thief is using his talents to put his sister through college. One day he picks the wrong pocket, grabbing the wallet of a young American woman who was delivering valuable and dangerous information. 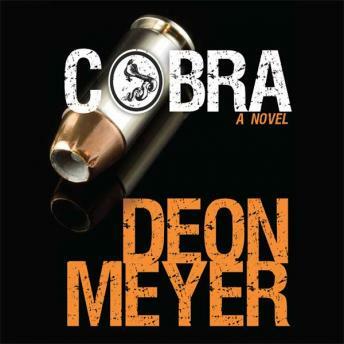 Before the day is over, five more people have been killed by Cobra, the sister is kidnapped, and the thief is on the run.Captain Benny Griessel and South Africa's top police unit, the Hawks, attempt to identify the missing man, save the sister, and track down Cobra. But when intelligence services step in, ordering them to turn over the investigation, it becomes clear that powerful people are involved. The Hawks, however, aren't about to let it go. Building to a deadly, heart-pounding finale, Cobra is a masterful thriller from a writer at the top of his game. An interesting insight into international banking and South Africa's niche in the world. Well written.